The Rescue Chute passing the high speed (160daN at 50 knots) deployment test at Acpuls. The rescue chutes are of a flat circular pull-down apex design. This means that in addition to the conventional lines around the perimeter (skirt), there is a single line in the center pulling the apex down to the level of the skirt running from the apex to the bridle. The main line attachments to the skirt are reinforced with V-Tabs, and the skirt and apex skirt are reinforced with 1" tape, and sewn with a four needle machine for an exact finish. This proven design offers the best combination of sink-rate, deployment speed, packing size and weight. 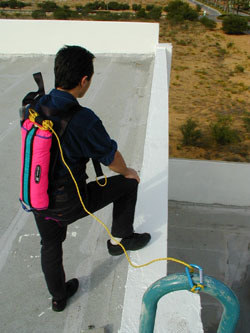 The rescue system consists of a harness with an Excecutive Chute container intergrated. The use of the system does not require training. 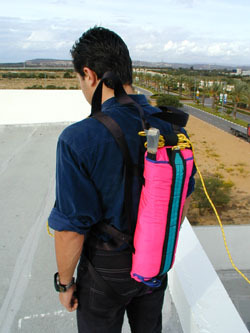 All that is required is a simple demonstration of the use of harness and chute. 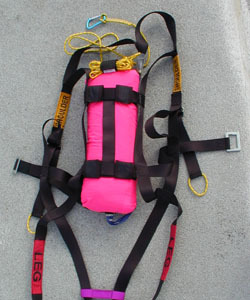 The rescue system will deploy automatically after 25m of free fall. The chute will provide a descent of approx. 5.5m/s with a person weighing 100kg. Additional possible applications include personal back-up and rescue of maintenance and construction workers on high-rise structures, towers, chimneys, cranes and for window cleaners. Apex Reinforcement Tape Mil T 5038-3 1"
Gore Reinforcement Tape Mil T 5038-3 5/8"
Skirt Reinforcement Tape Mil T 5038-3 1"
V-Tabs Mil W 4088-1 9/16"
Bridle Webbing 6000 lb UV Treated 1"
The right is reserved to change prices, specifications or equipment at any time without notice.